Degenerative myelopathy affects large-breed dogs but isn't a breed-specific disease. When you hear a term like "degenerative myelopathy" associated with large-breed dogs, it's easy to become concerned that your affectionate, active collie might be susceptible. Don't panic, though. As with any health issue, find out the facts of the disease as they relate to your dog's breed. Degenerative myelopathy is a disorder that involves the spinal cord. Although it is not linked to one specific breed, it does tend to affect large dogs. 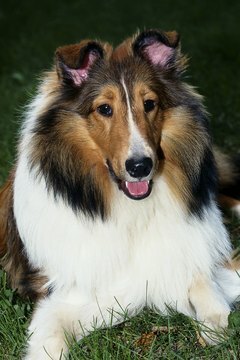 The breed that is most commonly associated with degenerative myelopathy is the German shepherd, but PetPlace.com notes that collies are among dog breeds that have been diagnosed with the disorder. Degenerative myelopathy is a disease that progresses slowly. Initially you might not notice the small signs of the condition, but they will become more pronounced as the disease worsens. Typically afflicted dogs have trouble standing from a lying position and have difficulty jumping. Weakness in the hind limbs is common, as are stumbling and tremors in the rear legs. The front legs usually don't display symptoms until late in the disease. Usually an affected dog will become incontinent. The unfortunate fact of degenerative myelopathy is that, although treatment will slow the progression of the disease and alleviate some symptoms, there is no cure. The VetInfo website describes the condition as one of progressing paralysis and notes that euthanasia is the typical outcome within a year of diagnosis. Vitamins and aminocaproic acid are effective at staving off the symptoms of degenerative myelopathy and slowing the disease. The vet may prescribe glucocorticoids and other medications and will probably recommend a homemade diet of vegetables and rice with tofu or pork for protein. Regular, gentle exercise and physical therapy is vital for dogs dealing with the condition. Swimming and walking will help slow the progression. When incontinence sets in, it is important to keep the patient as clean and dry as possible to avoid the risk of ulcers, lesions and skin infection. Although collies can get degenerative myelopathy, there are other health issues that are more immediately associated with the breed. Eye issues like progressive retinal atrophy and retinal pigment ephithelial dystrophy are common to the collie breed. Collies are also known to have problems with epilepsy, bloat and gastric torsion, and have been reported to have drug sensitivities due to a multi-drug resistance gene known as MDR1. If a collie carries the MDR1 gene, it can cause severe and possibly fatal reactions to even common drugs. These medications include heartworm medications and human antidiarrheal drugs that are routinely used to treat dogs. Are Pit Bulls Considered 'Dangerous' Dogs in California?